I don’t know about you, but when it comes to Star Wars lore, Han shot first. Anyways, now that we have gotten that out of the way, here we are with the $9.99 BoomCo Clip Fire Blaster that can be folded away for easy concealment. This quick-fire blaster can be clipped onto just about anywhere, and not only that, it will even be accompanied by a collapsible handle, now how about that for a few additional points of “coolness”? 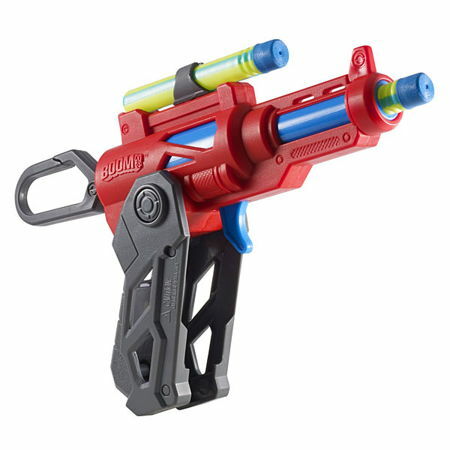 The BoomCo Clip Fire Blaster will shoot out Smart Stick darts, and as the name of those projectiles suggest, these will stick to targets and shields. Wait a minute here, does not this mean that anything is fair game, since everywhere you point it to would be considered as a target? Not really, what we are looking at here are Smart Stick Targets and Shields. In other words, only Smart Stick darts will, well, stick to Smart Stick Targets and Shields, and nowhere else. Sounds like magic, no? It can fire up to 60 feet away, and opens up a whole new window of office warfare whenever the boss heads out for a lunch meeting and the rest of the cubicle warriors would like to let off a little bit of steam. Certainly you might want to have this Roman Candle Fireball Blaster as a backup weapon.